Posted on November 7, 2007 under Travel. We decided to wake up early and do a spot bird watching in the morning. But due to the rains the previous day, we found the entire hill station to be shrouded in mist…or at least that was what we thought it was until we realized that it was actually a whole lot clouds passing though the hill station! With weather like this there was little chance for a spot of early bird watching and so we decided to take a trip and see one of the famous waterfalls in the vicinity. We decided to go to Hebbe falls which is about 10 Km from the hill station. The only way to get there was either via foot or by jeep. We decided to take the easy way out and take a jeep ride to the place. And it was a good thing we did, because for one the road was a tad long and winding, and many places there was no road ! We kind of drove off-road along the direction of the supposed “road” in many places. The scenery along the way was extremely beautiful with scenic green hills and picturesque little coffee plantations. We finally stopped at one of the plantations. Our driver / guide told us that we needed to travel by foot from there on. So we began following him through the plantations and finally though some jungle. After a little while he stopped at this wide stream of running water. The water was icy cold and about knee deep. Apparently we had to cross this stream, something our guide kind of forgot to mention. Unfortunately we couldn’t afford to get our shoes wet, as they wouldn’t dry out in this kind of climate. So we did the only thing we could do, crossed over barefoot. We casually asked him if there were more such crossings, to which he replied that there were another two more places where we had to cross the stream. With no other option, we continued on trekking barefoot, stopping after every few minutes to check for leeches. Some managed to crawl on, but we removed them before they could start sucking any blood. After a few minutes we finally reached the magnificent Hebbe falls. 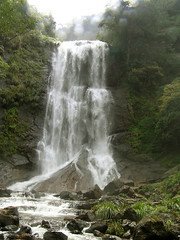 Here water falls down 168m to form two stages Dodda Hebbe (Big Falls) and Chikka Hebbe (Small Falls). We returned soon after. The evening was spent on bird watching and walking. Since the sun came out in the evening, we were amply rewarded spotting pirinas, a group of oriental white eyes, wagtails, bulbuls, hopoes, and even a pair of woodpeckers. Since tomorrow would be our last morning here, we decided to wake up a bit early and do a bit of bird watching.